"Holbeach Church (All Saints) is the most perfect example of the Decorated period of architecture...Entering the Church by this west door we find ourselves under a groined roof, within the ample tower which opens into the nave by a high and massive archway, the jambs and arch of which are boldly moulded. 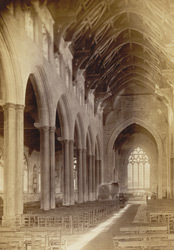 The church from this point displays a wide and lofty nave, the seven arcades of which on either side are supported by slender and elegant shafts of four-clustered piers, filleted, with a deep hollow mould in the returning angle...The length of the Church is 168 feet, and the width 68 feet." Text by the Vicar of Spalding Edward Moore from the book 'The Fen and Marshland Churches'.